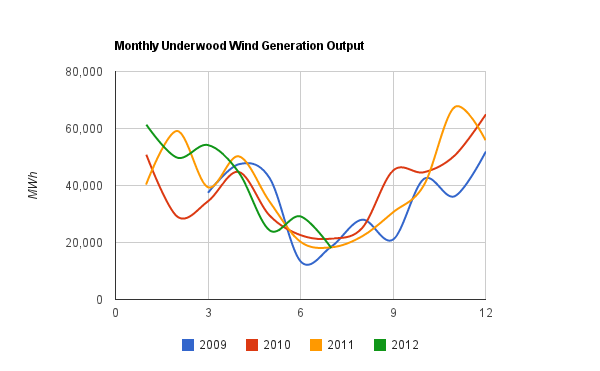 ... when the wind doesn’t get above 3.5 m/s – typically there’s a MINUS 50kw of production. This is power that must be supplied from the grid just to keep the turbine in business. And 50kw seems to be what the turbine uses to stay alive in good weather. In the winter it gets slightly higher – the highest negative numbers were in the 80 kw range. I decided to investigate the performance of an industrial wind turbine project in Ontario comprised of 110 of the Vestas V82 turbines; Enbridge's Underwood turbines in Bruce County. 110 turbines potentially each drawing 50kW means that at times when all Enbridge's turbines are still, the draw would be ~5.5MW. In the parlance of the Ministry of Energy, and the renewables lobby, a draw of 5.5 MW is enough to prevent power being provided to over 4000 homes. In Ontario, we know that wind is least productive in July - so the topic of how much "parasitic" load is present when turbines are unproductive is particularly relevant here. The turbines' manufacturer, Vestas, produced a Life cycle assessment of the V82-1.65 MW (the LCA) showing "energy balance" is achieved in 7.2 months of production. The "energy balance" is how long the turbine will take to generate the amount of energy consumed in production and disposal. The 3392 MWh they claim cannot include the consumption of electricity required for the operation of the turbine, as 50kW (the minimum cited in the Wind Farm Realities article) equates with 8766 MWh over 20 years. Presumably most of that amount is generated by the turbine itself, but the turbine is frequently idle, so some of that amount should have been in the LCA. The LCA based it's conclusions, in part, on a site offering an annual capacity factor of 39% (claiming 41% from tubine less 5% loss in cables and transformer). This is not true for turbine performance in Ontario; Enbridge's Industrial wind project in Bruce County (Underwood in IESO reporting), has had an average annual capacity factor averaging ~29%. If we added 5.5MW at all times (for the parasitic load), the turbines would be producing at 32% capacity factor (and consuming close to 10% of that). It's not surprising the 39% figure is not reached in Ontario, as the Wind Farm Realities post showed it wasn't reached at any location checked. Actual output being 25% below the levels Vestas used as typical, 'energy balance' is not achieved in 7.2 months of operation - and it seems unlikely Vestas accounted for the need to externally power the turbines intermittently throughout the 20-year life of a turbine. The amount of electricity consumed by Enbridge's Underwood turbines can be estimated from how frequently the 110 turbines, collectively, report no output. Not surprisingly, the graph of the monthly occurrence of hours with no output is the inverse of graphing the output, with July generally showing the highest percentage of hours with no output, at ~30% (the annual average is approximately 16.9%). Assuming the average draw from the grid during those hours is half of the maximum draw, parasitic consumption adds ~700MWh of energy consumption over the life of the turbine. Adding that to the LCA from the Vestas study, the total would be ~4100MWh, which is slightly under the average annual production from an Underwood turbine. The "energy balance" figure should therefor be close to 12 months. A far greater revision is required for Vestas' LCA claim that "wind power plant emits appr. 6.6 g CO2 per produced kWh." The LCA numbers indicate Vestas underestimates the figures for emissions generated in manufacturing, as the electricity used in the manufacturing of the turbine is argued to be quite clean, comprised of 70% hydro, 5% wind, and 25% the average of the European grid. The claims are suspect, as even if Vestas procured hydro, it almost surely displaced that hydro production from other usage. In Ontario, the largest customers are now offered rates that could only be met with the public generator's historic hydroelectric facilities; according to Vestas those large users would have no emissions, while residential consumers, deprived of the hydro production (which they own), must have escalating emissions. If Vestas could generate the additional hydro to power wind turbine production, they'd probably be focused on expanding their hydro business instead of contracting their wind turbine business. Assuming all power used in constructing a turbine produced average emissions, for Denmark's generation, the emissions would be ~ 19 g CO2 per produced kWh. While almost triple the figure provide by Vestas, that's still attractive, but it's also still incomplete. 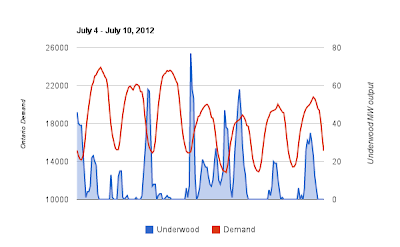 Reviewing weekly data for some peak demand periods since the Underwood Wind Generation turbines became operational, it is clear the turbines cannot replace any capacity, and, in fact, may be drawing power during the system's peak demand periods. 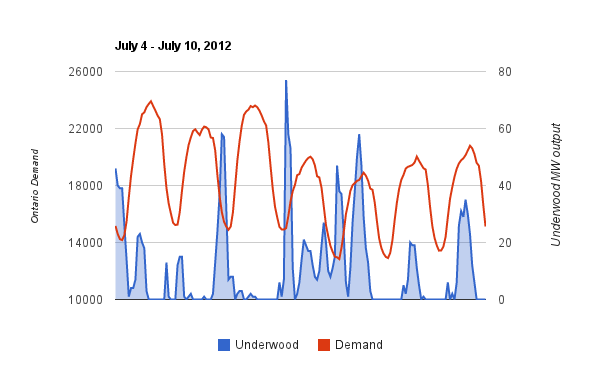 For instance, the afternoons of July 4-6th all experienced periods where the output of Underwood reported as 0. The poor performance of industrial wind turbines during Ontario's summer is well known, but there are also week periods of production in the winter. 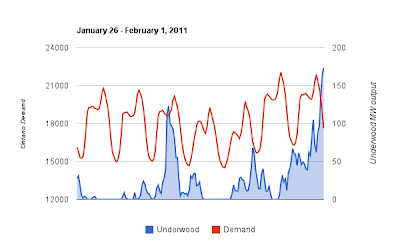 Over the past couple of years, the least productive winter week for wind (treating weeks as Wednesday - Tuesday) is also one of the highest average demand weeks in Ontario. The review of data for Enbridge's project therefore ends up emphasizing the same issues as many other reviews of many other data sources. While wind produces very little in terms of emissions, it also produces very little in terms of value. Unable to displace other capacity, it is inappropriate to measure the costs of wind generation without accounting for the negative impact it has on other generators. 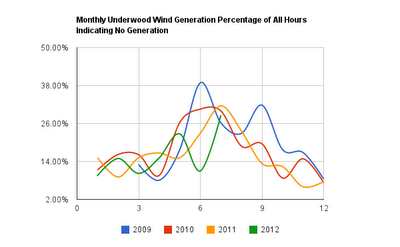 The IESO reporting of hourly output for wind generators does not show any negatives. It is assumed the meters don't measure the negative draw (ie. meters don't go backwards). Because I am using a 'parasitic' consumption for the 110 V82 turbines as 5.5 MW, a report of 0MW from the IESO indicates between 0 and 6 MW are being generated by the turbines. The calculation of 8% of all parasitic supply coming from the grid assumes an even distribution from 0-5.5 MW (ie. half). Hi there, always i used to check web site posts here early in the morning, because i enjoy to find out more and more. aspect effect like kidney failure and ect. for 22 years old i wish you might guide me much more right here. thanks a whole lot and godbless. I've been browsing on-line more than three hours today, yet I never found any attention-grabbing article like yours. It's beautiful price enough for me. leaking underground tanks - Non point source: delivers pollutants indirectly through or environmental change. ammonia allows bacteria to grow and nitrates are produced. or some of their records. This article is about generating sales with articles. and play. Therefore, we get a pleasant pair of headphones, really allegedly cool set of headphones, with a couple of assorted ends on available there. instead are only trying to get your money by any means possible. need some basic marketing training to get started.